Understanding the finer points of what a sweeping company does is essential if you are to understand why you should hire a professional to deal with surveillance attempts on you, your property, or your business. Read on to find out more about the services the best companies provide. If you are in a position where you find out that someone knows more about your private life or business than they should, whom do you turn to? The answer is a private detective company with experience and training in counter surveillance. Taking this step will ensure your safety, security and privacy is returned to normal. A specialist company will work with you throughout the process and be able to guide and advise you at each step. This work begins from the moment you make contact with them. They will begin by discussing your concerns, and any danger signs or actual devices you have found. From this information, they will be able to determine your level of risk and advise you on how to stay safe, and not give away any more information until the bugs can be removed. They will also discuss with you the best way for them to undertake the bug sweeping without compromising your confidentiality or raising the suspicions of anyone who is watching or listening. Once the bug sweep and removal has taken place, you will also gain advice and support on the next steps you should take, whether this is to take the information you have to the police or pursue the matter through legal channels privately. 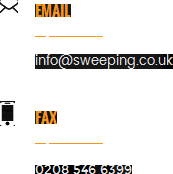 The work of a sweeping company is more in-depth than many realise and at Advanced Sweeping, we take these finer points just as seriously as the sweep itself. If you are looking for a complete counter surveillance support package, then visit our website http://sweeping.co.uk/ today.